It's a bit like that with Missy. On a daily basis, her tantrums mean that we, unfortunately, don't always notice the positive steps forward. But comparing two events this past week with the same events last year have really shown what huge steps Missy has taken in improving her confidence and lessening her anxieties. Last Tuesday it was the turn of Missy's class to lead the assembly and tell the school and us parents all about their big project. This included each child having words to speak and the whole class singing three songs. Turn back 12 months to last years assembly, we watched Missy stand there, occasionally mouth a few words but otherwise just stare out at the audience. We willed her to smile, to enjoy it. At the end, when the parents could give their kids a big well-done hug, we went up to Missy but she told us to go away with a thunderous look on her face. She didn't want us there at all. Another event last year was the school talent show. Missy had the chance to take part with a group from her class but on several occasions refused to practice. The teacher and I discussed it at length, her anxiety, her reluctance, her refusal to perform and decided that she wouldn't take part. Of course, Missy was upset and couldn't understand why she didn't get a medal. Back to this week. Wow! What a difference a year makes. At the assembly Missy, whilst a little nervous to begin with, soon relaxed, joined in with all the songs, knew all her lines and all this done with a big big smile. After the assembly, she was so happy to see me. She ran up to me and we enjoyed a big hug and kiss. I told her how proud I was of her and her smile grew bigger. She loved being on the stage and taking part. She loved that she knew all her words. I beamed all the way home. Then on Friday it was the talent show. This year as there were so many entries, the teachers could only choose three acts from each class. Missy had been practicing at home all week, mindful of what happened last year. Before we left for school, we had a chat about what might happen if she and her friends weren't picked but thankfully they were and the school got to hear their rendition of One Direction's 'Best Song Ever'. Seems they sang pretty well as Missy came home with a medal for second place around her neck! I beamed again. It was delightful to see how far forward her confidence has moved. It's times like this past week that we need to bring to mind when she's having a meltdown and I think I'm being a crap parent. Things are moving in the right direction. In other news, we've booked a week away in the sun, a bit of a last minute decision. Ahhh, the sun, the heat, how I've missed you. We can't wait! 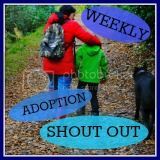 During the current Foster Care Fortnight, I'm delighted to be hosting my first ever guest post from the National Fostering Agency, one of the most experienced fostering agencies in the UK. You can read more about their work and find out if you have what it takes to be a foster carer on their website. "Why healthy and fun family recipes are great for kids in more ways than one"
The health of our country is coming under intense scrutiny right now, with particular emphasis on the health of our younger generations. The proliferation of junk food, processed meals, and sugary sweets and drinks is causing grave health concerns for many children. Being overweight at any time in life is never ideal or recommended but it has particularly serious long-term consequences for young people. Which is why it is so important to get kids into good habits early on life. And what better way to do this than by making cooking and learning about food in a family atmosphere really fun. If you can really engage with the kids and spark their imaginations by teaching them to cook early then you can help them to develop a really healthy and life-long relationships with food. This will ensure that they understand the importance and benefits of nutrition, eating sufficiently without over-doing it, as well as learning valuable life skills in the kitchen. For foster parents especially, cooking is a great activity for bonding and opening up lines of communication with foster kids. There aren’t too many activities that grown-ups and kids can all enjoy together but cooking and eating is definitely one of them. By engaging with the kids in your care, finding out what food they like, encouraging their creative side and giving them responsibility for preparing meals, cooking together is a very valuable experience. With that in mind, we’ve come up with some great family recipes that are really fun to make and that will also help to teach kids that healthy food can be just as exciting and alluring as all those naughty sweets. Pasta is full of energy and relatively low in fat, making it great for kids. And who doesn’t love meatballs? Besides, making them out of sausage meat is a really fun way of doing it. For the meatballs: 300g good quality pork sausages, 500g lean beef mince, 1 small onion - coarsely grated, 1 carrot - finely grated, 1 tbsp dried oregano, 50g parmesan, finely grated, plus extra to serve, 1 medium egg, 1 tbsp olive oil. Squeeze the sausage meat into a bowl and add the mince, add all the other ingredients and squish up nicely. Then roll into balls and place in a tray ready to cook. This is great for the kids to do themselves. For the tomato sauce: 1 tbsp olive oil, 1 courgette - coarsely grated, 3 garlic cloves, finely grated, 1 tbsp tomato purée, pinch caster sugar, splash red wine vinegar, 2x 400g tins chopped tomatoes. Adults can make the sauce by adding the ingredients one at a time, and blending the larger veg, if that’s an issue for the kids. Brown off the meatballs and add to the sauce. Cook through until done then add to pasta. With only four main ingredients and taking only a few minutes this couldn’t be easier. And any kind of salad is great to get the kids to eat. For the dressing: 1/4 cup peanut butter, 1/4 cup hoisin sauce. 3 Tbsp. canola oil, 3 Tbsp. rice wine vinegar, 1 Tbsp. chili garlic sauce, 1 tsp. garlic powder, 1 tsp. honey, salt and freshly-ground black pepper to taste. Simply mix all the salad ingredients together in a bowl, then do the same with the dressing ingredients and pour over the top. And how about something for pudding? Fruit salad is easy, flexible and delicious. Get the kids to pick their five favourite fruits (a clever way of getting them to eat some of their five a day). Then set up a small production line of chopping and peeling, even making some fun shapes if you want. Then mix all together. And if they have extra fruit you might even let them have a little bit of cream or ice cream with it too. Again, it shouldn’t be too hard to get the kids to eat biscuits but teaching them how to make cookies gives them a better idea of what is in them, plus you can control the amounts of sugar and butter. Getting kids interested in baking so early is much better than just buying packets from the shop. Plus, the homemade ones always taste better. Ingredients: 180g softened butter, 1/3 cup (75g) caster sugar, 395 g sweetened condensed milk, 1 1/2 cups (225g) self raising flour, 250g chocolate bits. Preheat the oven to 180˚C and grease two baking trays. Using an electric mixer beat the sugar and butter until creamy. Add the condensed milk, stir in some flour and then the chocolate bits. Make some heaped tablespoons into balls and place on the tray, pressing gently with a fork. Then bake for 15 minutes or until ready in your oven. Leave to cool before eating. The week's theme on #WASO is music. I love having music on in the house. It's mostly 70s/80s which I love. Heaven 17, Come Live with Me, is currently playing - loooove that song. My brother is 8 years older than me so there was always the latest music playing when I was little. He even let me play his singles when he went out! I used to stand on his bedroom chair and dance to everything from Kung Fu Fighting to Turning Japanese (and no, I had no clue what the lyrics were about back then!). My favourite tune to dance to was Born To Be Live by Patrick Hernandez and I still often put it on You Tube now and dance and sing along because it is soooo feel good. Back in the 1980s I was a huge Duran Duran fan. Ah, those were the days. 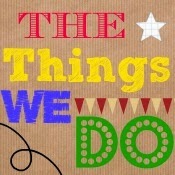 I used to spend hours making up scrap books and relishing any mention of DD on the radio, TV or in a magazine. Not like now, when I can choose to listen to them any time, any day what with the internet. I went to a DD concert once and was right down the front. In fact I think John Taylor kicked the teddy I threw on stage. Screeeeam! Oh I could write forever about the 80s music scene. I have endless memories (as opposed to Careless Memories - see what I did there?) about late 70s/early 80s songs that form the soundtrack of my life. When I was at school in the sixth form, myself and two friends represented the school on Mike Read's Pop of the Form on Radio 1 - unfortunately we were pipped at the post by a school from Devon. Boo. Missy's love for music is growing. We've given her a small portable CD player for her bedroom and, like many girls, she loves One Direction. She is obsessed with Katy Perry and Roar and when we play hairdressers (daily) then Katy Perry aka Missy is the hairdresser! So, as I was so proud of her at the hospital this week, I bought her the latest Katy Perry album. I've also given her a few of my more calmer CDs that I used when I was working. However, thanks to Missy, a new style of music often fills the house. Classical. Now, I do like some classical, although I'm no expert and probably couldn't tell you the performer and it's definitely not my first choice, or even second choice. But one day Missy decided to turn the TV off and turn over to the radio (which plays through the TV). Somehow she found BBC Radio 3 and that will be her first choice of channel when she wants to listen to music whilst we are playing or doing some craft. And, you know what, it's growing on me. Some of it is very uplifting and some of it is beautifully calming, the latter being very good for Missy. Whilst she now also knows the channel number for Absolute 80s, Radio 3, and also now Classic FM, is her first choice. And in fact if it's within an hour of her bedtime I will tend to turn onto classical music if it's not on already to subconsciously help calm her down. There does come a point when I've overdosed on classical music and back to the 80s we go, but I have to say I'm very grateful to Missy for introducing me to the classical stations. Any suggestions for some calming classical music to listen to? What music do you and your children like? When you have a child, birth or adopted, you wonder if they'll like the same things as you as they grow up. Having adopted a five year old with definite ideas of her own and who probably had never been on a countryside walk before, we hoped she would come to enjoy our love of the outdoors. Would she moan every time we mentioned the 'w' word? Would the Lake District be a distant memory for us? Well, after a wobbly start, I'm relieved to say she loves walking. Hurrah! We bought her some proper walking boots last week and she loves long walks, thinking nothing of a 3-4 miler around the local countryside, which for her little leggies is quite impressive. Of course, it's even better if we take a picnic with us. As this morning looked set to be sunny and warm, I asked last night if she'd like to walk to school, which is about 1.7 miles. Yes, yes! she shouted. The first thing she whispered to me this morning as I wearily opened one eye was "Mummy don't forget we're walking today! Walking to school meant we had to leave 25 minutes earlier than usual and miss Tracey Beaker on CBBC (thank God) and she was ready in good time so off we set in the sunshine. I do feel so much better when the sun is shining and Missy was in a great mood too, pointing out lots of flowers and other things along the way. We arrived at school in good time, Missy telling everyone that she'd walked a long way - well she had and some of the 4x4 mums were quite impressed. I walked back, this time with a brisk march, and even managed to jog some of the way. The exercise and the sun has meant my mood is so much better today, and topped off this morning with another weight loss at Slimming World. This week is Mental Health Awareness Week, a very important week in my opinion as I believe far far more people need an understanding of mental health issues and how they affect people. The problem with mental health is that other people can't, for the most part, see you suffering and because people present themselves as appearing physically well, others assume you are fine. But inside you're in knots. 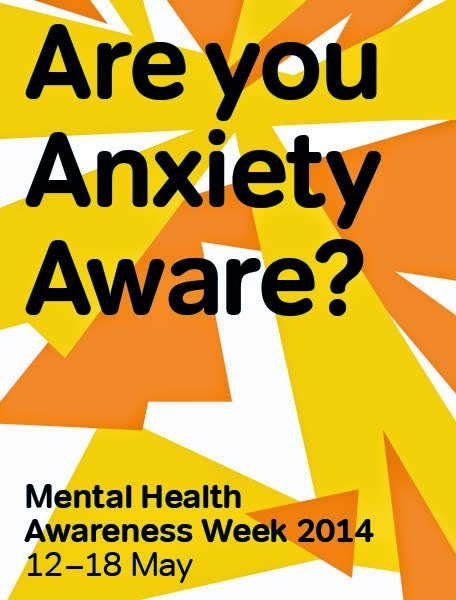 This year, Mental Health Awareness Week is focusing on anxiety, something I know quite a lot about. Many people can say they've felt anxious over something, maybe exams or meeting people, and they'll have no lasting effects. However, for those suffering with chronic anxiety, the situation is much different. Anxiety is a deep sense of worry, a perceived fear, without there being a definite cause or outcome, ranging from phobias to panic attacks. Symptoms differ from person to person but can include breathlessness, heart palpitations, tight muscles, insomnia and dizziness. Anxiety can lead to lack of confidence and self-esteem, crying, feeling irritable and depressed. My first memory of a panic attack was with an ex-boyfriend in my early 20s: I can't remember exactly why but I remember exactly where I was which was in the car on the way home. I remember not being able to breathe properly and the feeling lasted a few minutes. My second memory of anxiety, which continued for many years, was sitting on my sofa about 2pm watching TV when I noticed my heart beating rapidly. It felt like it was going to burst through my chest. This coincided with my marriage starting to breakdown. For the following five or so years, I would wake every single morning in a state of anxiety with my heart beating rapidly and feeling breathless. Lots was going on in my life at that time; work stress, divorce, relationship stress (see a pattern? LOL). However, in this five year period I did go backpacking around the world alone, a big deal for someone with little confidence, but I loved it and it was a wonderful healing experience for me because no-one I met knew me and couldn't judge me. Back home, I turned to homeopathy, my confidence grew, I started running, met Daddy and life took a massive positive turn. My second panic attack, about 10 years ago, was triggered by my tinnitus which I've suffered from for many years. If, when I'm in bed, when all is quiet and I focus too much on my tinnitus, I can feel the panic rising. It's a feeling of being trapped within these sounds for the rest of my life. Luckily I fall asleep quickly so I don't have to lie there too long listening. So, for a while I enjoyed a good period of my life without too much anxiety - apart from moving house four and a half years ago - but then we decided to adopt. Soon after Missy came I home I had the biggest Panic Attack I've ever had. I honestly felt I was going to die, it was horrible. Since then I've had a smaller panic attack and seem to have returned to that state of constant anxiety; heart pounding, unable to settle, lack of concentration, lack of self -esteem, digestive problems. Sometimes it's hard to explain how I feel and all I can say is that I feel 'unsettled' and 'all a bit of a to-do'. I'm not exactly sure what triggers it now because on the whole Missy's behaviour is fine and we can generally manage her and ourselves when she is in meltdown mode. It may be financial stress - I'm not earning but I'm not confident enough to return to my self-employment and I can't find a 9 to 5 job as Missy needs me here before and after school. It may be loneliness perhaps - apart from the school run (which itself I hate), I don't see many friends each week - this is where Twitter and my adopter friends there have been a lifeline. I am seeing some fellow adopters each week and really look forward to seeing them all - talking things through, sharing feelings and being supported is a huge step against anxiety. I've had some good periods, particularly when I concentrate on doing meditation and mindfullness and my new found love for my vegetable plot is really helping. I'm not a fan of anti-depressants but do find homeopathy and, currently, St Johns Wort are helping take the edge of things. I really miss running which helped get back on track nine years ago and really need to get my back sorted before I can start again. I have started to go for long walks during the day which I'm really enjoying. I've returned to healthier eating - too much sugar was bad for my system, plus I put on a stone in weight which in turn meant I couldn't fit into many clothes and my self-confidence took a dive. Even whilst writing this blog, I can feel my anxiety levels rising. So once I've finished I shall have a warm drink and then do some meditation before I hit my to-do list. According to the Mental Health Foundation, 1 in 4 people suffer from chronic anxiety. Chances are you probably won't even realise that one of your friends, family or colleagues are suffering. But if you find out they are, please give them as much support as you can. It's so important that mental health issues are taken very seriously and sufferers don't feel like they have to live with the stigma of a mental health disorder. You may have read in other blog posts about Missy being anti-Daddy. She only wanted me to wash her, read her story, go out with her, listen to her read, play with her etc. If I said Daddy was going to do it then the responses would be a loud "oh bor-ing!". Unsurprisingly, this was getting to Daddy somewhat. Nothing he could do was right (unless it concerned going to a particular play area or playing rough and tumble). I felt bad for him and I felt exhausted by her constant attention. However, I'm pleased to say that Daddy is now top man. This has pretty much been the case since the Celebration Hearing. I think Missy is now used to having a Daddy, used to his new work routine, that he's around at weekends and ok with the fact that he can't take her to school anymore. It could also be that some of the ideas we've learnt through therapy and training are working. Whatever it is, I like it. The other day there was lots of laughter in the garden with them playing football and today much more laughter in the house. I thought they were playing Lego but somehow it turned into fun chase round the house. Wash time in the morning is mostly going without a hitch and Missy even only wanted to read to Daddy one evening this week. She's happy to hold both our hands when she is out and is happy to include Daddy in the pretend play when he gets home. Over Easter Missy helped Daddy in the garden by helping dig around some old tree stumps that he was removing and she's loved going out on her scooter with him following. Sure there are still times when she only wants me but from what I can gather from other parents, mummies are generally first choice. But this is fine by me as on the whole she is no longer anti-Daddy (recent meltdowns aside when she wanted to kill him!). In other news, I'm loving growing all my veg and ridiculously excited this week seeing all the spinach, carrot, parsnip and broccoili seedlings coming up. This gardening lark is definitely helping to lift my depression. Well that was a weekend of two halves. Friday afternoon continued as the morning started, with a meltdown. Happy as anything walking out of school with a friend but as soon as on her own with me, Missy was miserable, rude and violent and this continued for the next hour. I tried to do the special play that we've learnt through some training but just got a barrage of verbal abuse that upset me so much I was fighting back the tears. As soon as Daddy walked in, I ran upstairs to cry. Daddy was brilliant and although he got screamed at, he did manage to calm Missy down. Saturday started well. We went to a large camping store and fitted Missy out with some cool walking boots and then went to a local park we'd heard about from other adopters. The play area there is very good and Missy loved it. But back home, when it was time for lunch, Missy went into meltdown again, triggered by not wanting what I was cooking (which on other days she would love). This time she tried to bite me several times, kicked me, said she wanted to kill Daddy and hated us all. She refused to eat her lunch but at the same time screamed at us when we removed it from the table. Unfortunately Daddy and I didn't have our therapeutic hats on and probably could have handled the situation better. Eventually she ate her lunch and then kicked off again, literally. This time I took her to her room to calm down, listen to her CDs and eat some grapes. After about 20 minutes she came down for a hug and apologised to both of us. The rest of the day was fine and Missy happily watched Matilda whilst Daddy and I did some gardening. At the end of Matilda, the little girl gets adopted by her lovely teacher, Miss Honey. Missy came to find me and said "So, Mummy, it's a happy ending because Miss Honey adopts Matilda, a bit like my happy ending with my family". On Sunday, after breakfast we headed to a local nature reserve for a guided two hour walk. There were about 15 of us, with one other child, listing to the very knowledgable Ranger. It's so lovely down there and used to be part of my regular running routes. I miss running around there but we try to walk there regularly. Missy really enjoyed it, in her new shoes. Then back home for lunch and into another meltdown, again triggered by food that normally she loves. An hour later and she was calmer, having eaten her lunch. I was tired. I've been feeling quite low the last few days and this dark cloud feeling really wipes me out. However, the afternoon passed by with Missy helping me sow some seeds and then she spent some time on her bike. She's almost got the hang of riding but still can't get started by herself. But yesterday, after a few huffs and puffs, throwing her bike down and an 'I HAAAATE this bike', she managed it three times. Hurrah! The rest of the day passed without incident. Yesterday started with a huge tantrum. Triggered by food. Again. She didn't want what we were having which was smoked salmon (65p bargain bucket), scrambled egg and toast event though she's had it before and thoroughly enjoyed it. The other option was cereal and fruit, which she normally has every day before school. Cue screaming, cheekiness and verbal abuse. She also screamed that she wished she didn't live with us and wanted to live by herself. As usual she eventually calms down and all is ok, although I'm left feeling battered. If we ask her if she can explain in her own words what is upsetting her, she will more often than not scream "Because of YOU!". I wondered out loud if it was because of her friend moving. And then we went for a lovely walk in the local countryside, about 90 minutes, before stopping for our picnic (smoked salmon sandwiches by the way, Missy's choice). Missy loves walking and we often turn it into a treasure hunt, although she'd found most things in the first 20 minutes. Daddy had planned the walk so as to go via a village green where there is a large play area, so Missy was very happy. And the rest of the day was fairly peaceful. So that was the weekend. Up and down. Round and round. Daddy and I could do with a rest to recover. We can go on endlessly thinking "is it because of this, its it because of that" and I hate having to analyse everything to consider if it's what is triggering Missy. This morning Missy just wants to go to school to get away from me apparently (woken up in a bad mood). At the moment I'll reserve judgement on that happy ending just now if that's ok.